Now if you or I were lagered for 42 days we’d probably be on a drip in hospital and dead if pasteurised, but Frontier benefits from the extended time and absence of cooking. The resulting beer is soft rather than crisp and pretty full in the mouth, picking up an energetic pace as the orangey citrus notes emerge from amongst the bright malt and yeastiness with perfect clarity of flavour. Its creator, brewer Rob Topham, lets DrinkBritain.com into the secret of its flavour-punch. 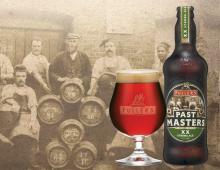 By using the Fuller’s ale yeast rather than a typical lager yeast, the fermentation temperature was higher than for a normal lager. “We want to speak to those lager drinkers who want flavour,” says head brewer, John Keeling, adding that this beer has been on the cards for a few years. Launched initially in keg in 50 pubs, nearly half of which are Fuller’s ones, the hope is that it will spread organically over the months, reaching hundreds of hostelries by the end of the year, and escaping into bottle too next year. Of course in a company the size of Fullers, it has to make commercial sense as well as offer a tasty prospect for a beer to come to market. Notwithstanding that, on balance, DrinkBritain.com thinks they have pulled a real rabbit out of the hat. Frontier is a refreshing, super clean lager with a moreish and pithy bitterness at the finish. Crucially it also has enough presence and flavour intensity to please the beer geek without scaring the everyday lager drinker. All round a job very well done indeed.